The 16-year-old Dolan Twins, who have amassed 1.6 million subscribers on YouTube and 6.4 million cumulative subscribers on Vine, will be setting hearts aflutter in person this summer as they embark on their very first world tour. Dubbed the ‘4OU Tour’ — shorthand for ‘For You’ — the guys will hit 12 cities over the course of June and July, with a set featuring comedy, live music, meet-and-greets, and surprise opening acts. The twins had teased a forthcoming tour on their YouTube channel last week (below), but tickets officially went on sale today. VIP passes will be available soon, and additional cities and international dates will be announced in coming weeks. The tour is being produced by Mills Entertainment, which has previously created live shows for the likes of Tyler Oakley, Lilly Singh, Roman Atwood and FouseyTUBE, and Kian Lawley and JC Caylen. 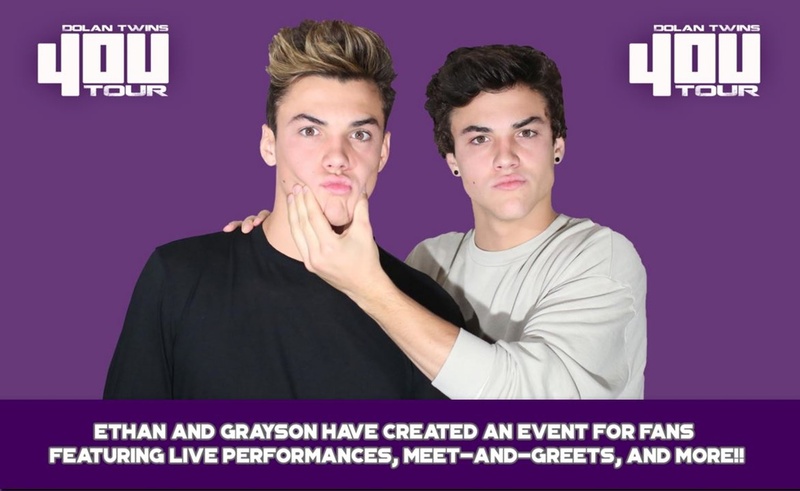 “Ethan’s and Grayson’s fans have been eagerly awaiting the Dolans’ first live tour, and we couldn’t be more excited to make this a reality for them,” Mills Entertainment CEO Michael Mills said in a statement.